Along with all living things, we have a complex immune system that helps our bodies seek out and destroy pathogens. There are actually two immune system branches: Innate and adaptive. The adaptive immune system is the acquired immunity we develop over our lifetimes, the system that releases antibodies that are specifically able to kill a pathogen. Vaccines build upon these adaptive mechanisms to protect us from some infections. The innate immune system is not as specific as the adaptive - it does not target specific pathogens - but it is the first line of defense against infection. This system involves barriers, both physical and chemical, such as the skin and mucosal lining of our GI and respiratory tracts. Within the first hours of exposure to a pathogen, the innate immune system activates the inflammatory response, allowing more blood to flow to the affected area. It sends in white blood cells to begin the process of destroying the bacteria, and it also activates the adaptive immune system. So where does copper fit in? All living things use copper as a trace micronutrient in many aspects of metabolism. Because it readily accepts and donates electrons, it is a very versatile element to use to speed up the breaking down and building up of molecules - that is, it serves as an important feature of catalyst enzymes. Our bodies have complex systems to regulate the amount of copper, keeping it at a healthy level known as homeostasis. It is important to regulate the level of copper, since too much can lead to cell death. And it is this very danger that the body capitalizes upon when fighting infection. 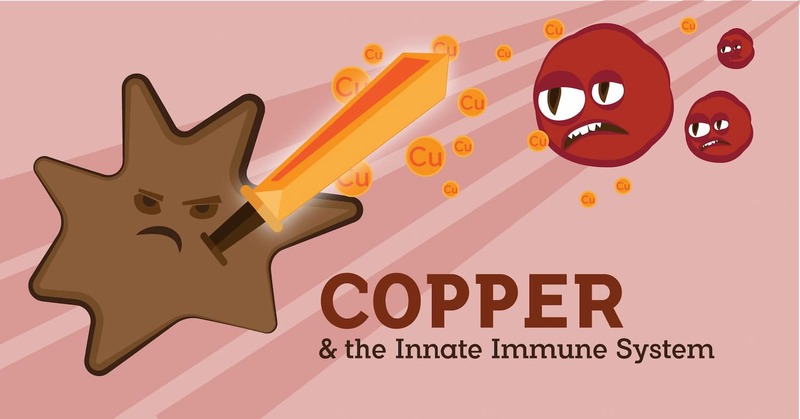 It is believed that the body, specifically, the phagocytes released by the innate immune system response, use concentrations of copper to kill bacteria or use chemical means to prevent bacteria from acquiring copper. This theory is supported by several research findings. Studies have shown that elevated concentrations of copper can be found near the sites of infection. Other studies have shown that copper deficiency in the host can be linked to increased susceptibility to infection (and improved immune response when the host is provided with a copper supplement). Strains of bacteria that have impaired copper detoxification (they are not good at getting rid of excess copper) have been shown to have decreased virulence. Finally, several proteins have been discovered that bind to pathogens, effectively blocking the invader’s access to key micronutrients, including copper. While research is ongoing, recent findings seem to point to phagocytes using copper (and zinc) ions as a redox catalyst, breaking down the cell walls of bacteria. Sound familiar? That’s exactly how the copper in EOScu continuously kills bacteria.